Paraffin (and) paraffin, synthetic (and) Copernicia Cerifera Cera. 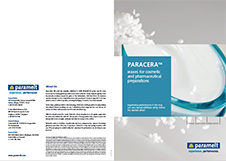 Paracera™ C 44 by Paramelt acts as a consistency factor, binder and co-emulsifier. It is a blend of carnauba and other waxes that increases hardness and gloss of decorative cosmetics and sticks. Paracera™ C 44 gives increased temperature stability to cosmetic products. Its applications include creams and ointments and other cosmetic care products. It has a shelf life of at least two years.